This post may contain affiliate links which won’t change your price but will share some commission. 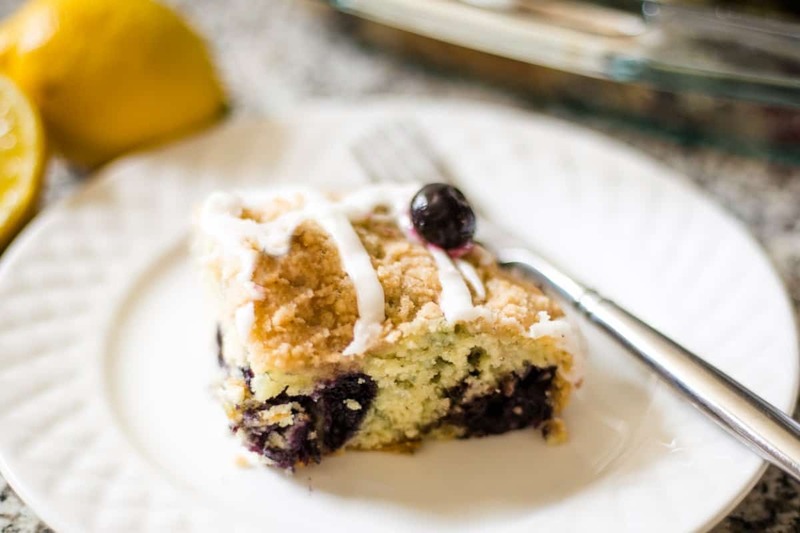 This deliciously moist Blueberry Crumb Cake is loaded with juicy berries, topped with a buttery cinnamon streusel, and drizzled with a tart lemon glaze. 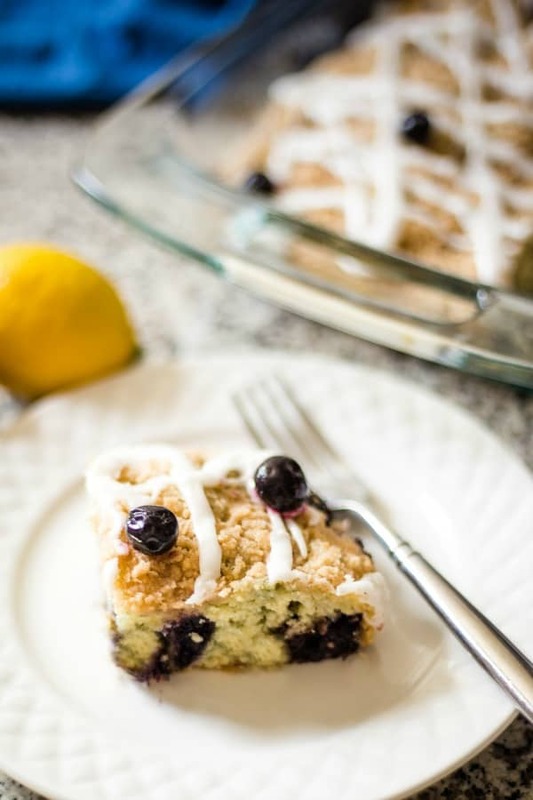 Just like how blueberry and lemon flavors naturally work together, a crunchy streusel topping on coffee cake is always scrumptious. 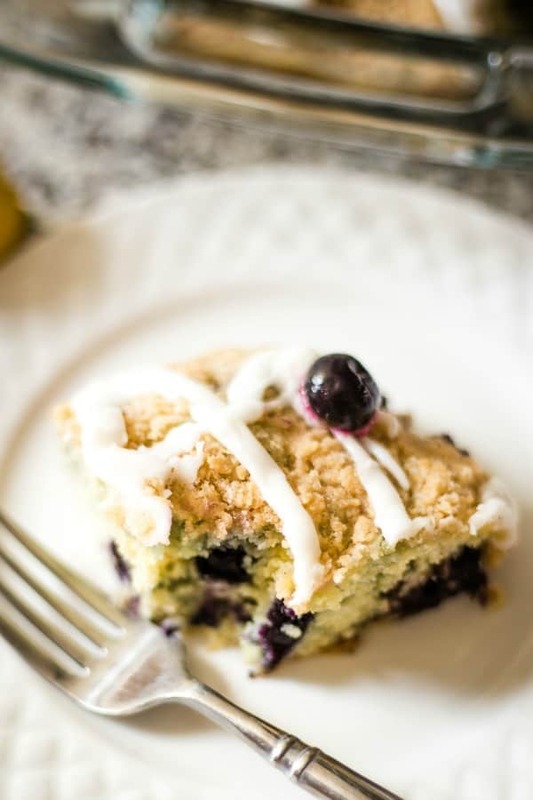 Combine all three and you have the best blueberry crumb cake recipe ever! 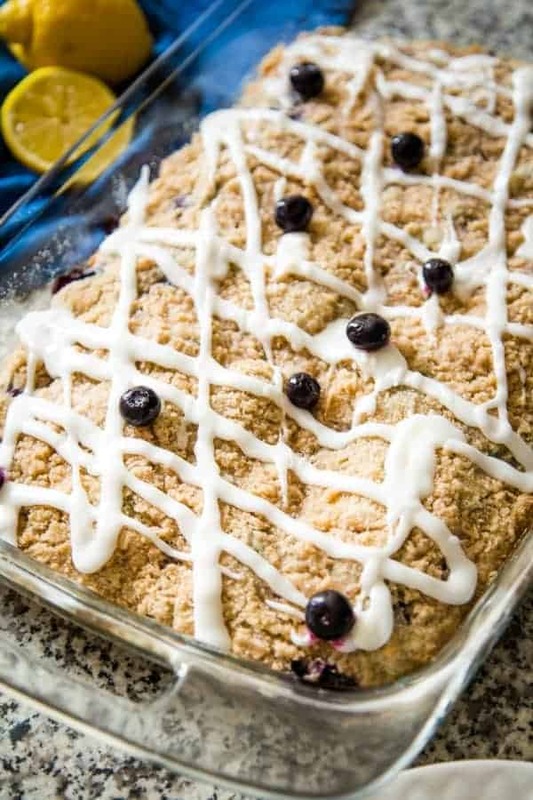 This Blueberry Crumb Cake with Lemon Glaze recipe can be made with either fresh or frozen blueberries with the same amazing results. This coffee cake is perfect for a weekend brunch, dessert, or as a snack cake. If you like blueberries and you like cake, you’ll love this recipe! 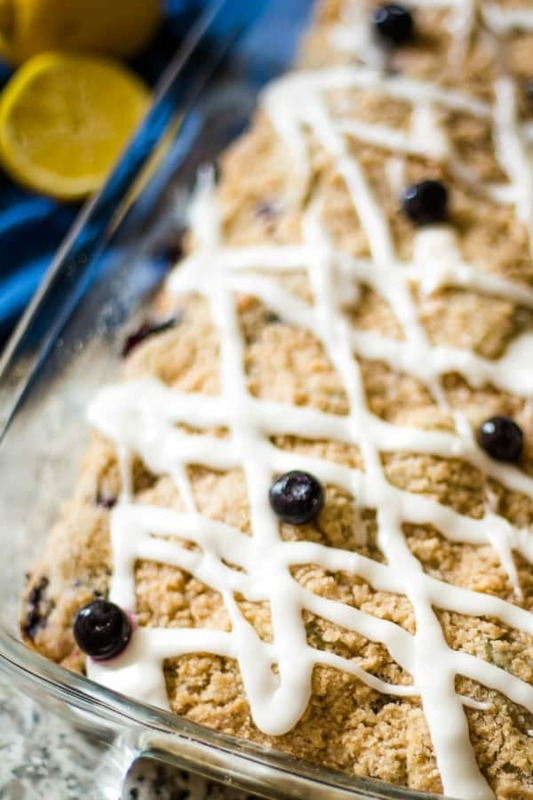 It’s a good thing that blueberry season is just around the corner, because I’ve almost used up my freezer supply and I know I need to make one of these Blueberry Crumb Cakes again soon! Lucky for us, my father-in-law has mature blueberry bushes and every summer he graciously shares the bounty with us. As a result, we enjoy blueberry compote on pancakes, blueberry streusel muffins, and blueberry pie bars all year long. However, I do believe that today’s blueberry coffee cake is my favorite. I made it last time when we were visiting our daughter’s family in St. Louis and it was gobbled up in no time! What makes this coffee cake so moist? Naturally, adding fruit to a cake will create some moistness. Sour cream in the batter, however, is primarily responsible for the moistness of this crumb cake. Creaming the butter and sugar until the mixture is light and fluffy helps create a spongy, springy dough, instead of a chewier texture. It’s also important to avoid over mixing the batter after you add the dry ingredients so that the cake does not turn out tough. Follow the recipe directions and only mix until the dry ingredients are incorporated. This cake batter is thick. Use a spatula to spread it evenly into the baking pan. Make sure the blueberries are well drained before folding them gently into the batter. If the blueberries are too wet, the batter will end up with purple streaks. When using fresh blueberries, rinse the berries and then pat dry with paper towels. 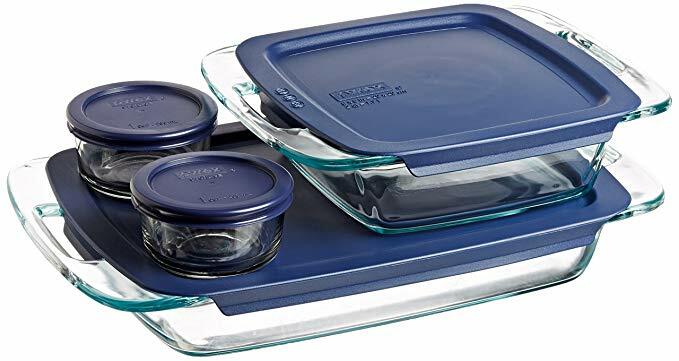 For as long as I can remember, I’ve had a set of Pyrex glass oblong baking dishes. My daughter has a newer version with easy grab handles and plastic lids for storage. The lids fit tightly and when covered, the dishes stack easily in the fridge or on the counter — a very handy thing in small kitchens! 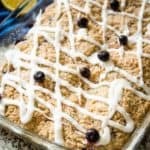 Did you make this Blueberry Crumb Cake recipe? This deliciously moist coffee cake loaded with blueberries is topped with a buttery cinnamon streusel and lemon glaze. In a medium size bowl, whisk together the flour, sugar, and cinnamon. Use a fork or your fingers to work in 4 tablespoons of softened butter until you have uniform crumbs. Set aside. Preheat oven to 350 degrees. Lightly coat a 9x13 glass baking dish with cooking spray and set aside. Whether using fresh or frozen, be sure the blueberries are well drained. Rinse fresh berries and pat dry with paper towels, or drain frozen berries in a colander while making the cake batter. Add flour, baking powder, baking soda and salt to another medium size bowl and whisk until combined; set aside. Using a stand mixer or a hand held mixer, cream the butter and sugar in a large bowl until light and fluffy. Add the eggs one at a time and beat after each addition, scraping down the sides of the bowl. Add the sour cream and vanilla and mix until combined. Add the flour mixture to the batter, mixing JUST until combined. Gently fold in the blueberries until distributed throughout the batter. Pour the batter into the prepared baking dish and sprinkle evenly with the streusel topping. Bake for 35-40 minutes or until a toothpick inserted in the center comes out clean. Cool on a wire rack for 15 minutes. Add powdered sugar to a small bowl. Add lemon juice a tablespoon at a time, stirring until the desired consistency is reached. Drizzle glaze over the cooled cake and serve.